This is my Rosalyn Rosenfeld meets Foxy Brown festive holiday look. As soon as I put on this vintage coat--given to me by the hub's grandma years ago--I immediately wanted to get my American Hustle on. Not sure if you've noticed this about me, but I tend to get a bag and latch on to it. That means, prepare to see this Kate Spade beauty all the damn time. But I think it goes pretty well with these red pants. When I thought "holiday look" red, black and sparkle came to mind. And this is as festive as it's going to get, as I have no Christmas tree or decorations in my home. Maybe next year. Not being a Grinch. Just more concerned with the playoffs, lol. I'm becoming a little less busy, so I'll make my way to your blogs this week. In the meantime, keep up with me on Instagram. I spend way too much time there (because my phone is always with me, and my laptop isn't). this look is just so fabulous love it. Très chic, Cheryl! So digging that bag too. That goes with anything! 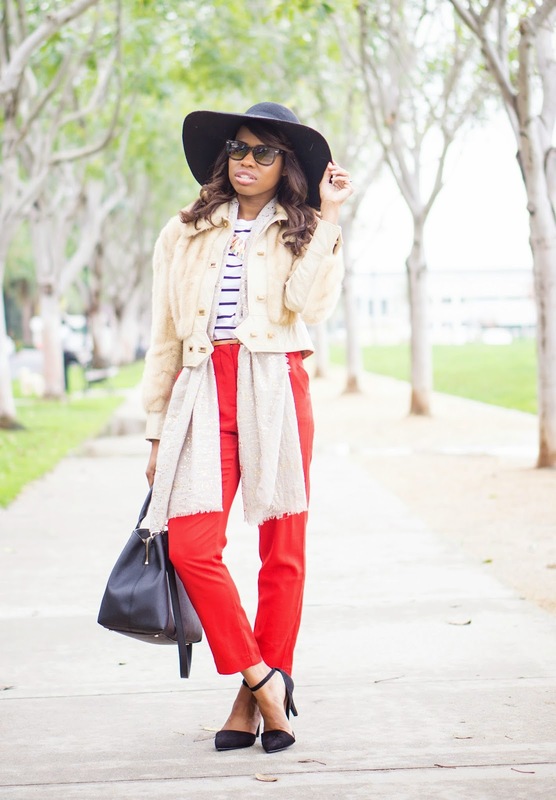 I love the mix of stripes with the red pants and that Kate Spade bag is lovely. The vintage fur coat looks very trendy and modern too. Have a very merry Christmas..
How awesome that A's grandma gave you that coat! The look is definitely festive and Foxy Brown. You are also reminding me that I need a new bag - the hunt continues and I love your classic bag! Such a chic holiday look Cheryl! Love how you thought outside of the box! That coat is fantastic and I love the simple sparkle on your scarf. I'm totally ok with seeing that bag many times, it's such a goodie! hahah playoffs!? I had no idea you were a big football fan! I'm guilty of not having a xmas tree this year either, which is probably why I've been admiring other people's decorations. The pretty Subtle Luxury speckled metallic scarf and bright red Ark+Co trousers combine for a wonderfully festive holiday look! Very pretty. Looking very much like a Hollywood Star girl, loving the hat! 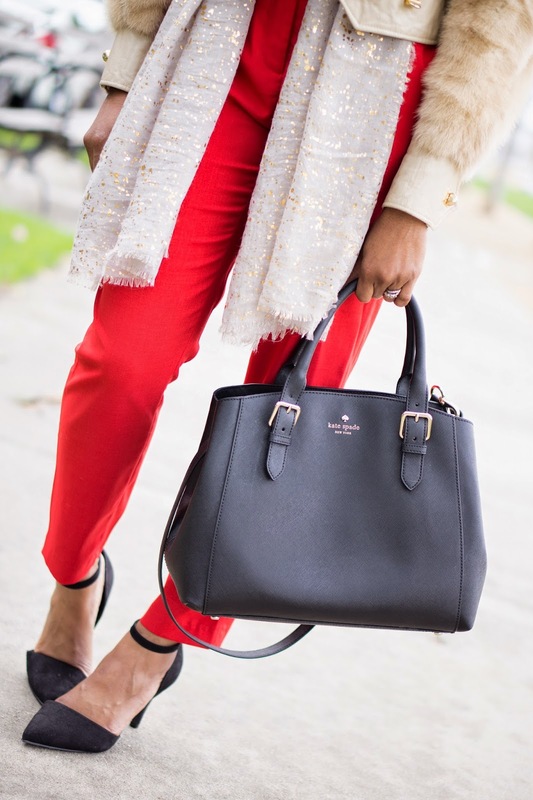 The red pants are so festive, and I love the addition of the fur and metallics, so luxe. Love this look, I've been looking for a fedora for ages but they never seem to suit me - you look great though! Work that holiday red, babe! Love this look. :) Merry Christmas! How perfect is that scarf and bag?? Those pants are killer! And love your vintage coat! I feel you on being on IG too much. It's a problem for me! I swear I'm killing my eyes with my iPhone in general. I need to put my phone down! The vintage coat is fantastic! Hope you have a wonderful Christmas!